Prior to the Beijing Olympics, only one British competitor had won three gold medals at the same Games. The feat was achieved by freestyle swimmer Henry Taylor, who won the 400 metres, 1,500m and 4 x 200m relay at the 1908 London Olympics. One hundred years later, track cyclist Chris Hoy matched Taylor’s achievement. 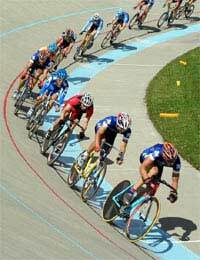 Hoy, a 32-year-old Scot, won the team sprint, keirin and sprint in China. Hoy’s Olympic success story had begun eight years earlier in Sydney, where he won a silver medal with Craig MacLean and Jason Queally in the Olympic sprint. At the Athens Games in 2004, Hoy went one better and claimed gold ahead of France’s Arnaud Tournant in the one kilometre time trial. Yet, rather perversely, it was the decision to remove the one kilometre time trial from the 2008 Olympic programme that led to Hoy switching events and, ultimately, becoming an Olympic legend. The first of Hoy’s gold medals in Beijing came in the team sprint. Earlier in the year, at the Track Cycling World Championships in Manchester, France had won the team sprint, with the British team of Hoy, Ross Edgar and Jamie Staff forced to settle for second place. The Brits were dominant in China, though. Hoy, Staff and Jason Kenny were always in control of the Olympic final and won in 43.128 seconds – 0.523 seconds ahead of France. With one gold medal in the bag, a golden treble became a real possibility for Hoy, who had won both the keirin and sprint titles at the world championships only five months earlier. Sure enough, Hoy’s second gold medal of the Beijing Olympics came in the keirin, with his rivals unable to cope with his power and ability to burst clear of the pack. Hoy lived up to his billing as the red-hot favourite and led home fellow Briton Edgar. The gold was the 700th medal won by Team GB in the history of the modern Games. As the third gold of his Olympic career, it also made Edinburgh-born Hoy the most successful Scottish Olympian of all time. Hoy clinched his hat-trick of Beijing gold medals in the final event to be decided in the velodrome – the men’s sprint. Once again a fellow Briton was his nearest rival, with Hoy facing Kenny in the best-of-three race final. Hoy was pushed all the way by his 20-year-old team-mate in the first race, but edged it by half a wheel's length, and he dominated the second dual, giving a victory salute as he crossed the line. That moment was the sporting pinnacle for Hoy, who had raced BMX and rowed for Scotland – winning a coxless pairs silver medal at the British Championships – as a junior. His achievements rank him alongside Steve Redgrave, Matthew Pinsent, Daley Thompson and Sebastian Coe as the pick of Britain’s Olympic heroes.